Served with sour cream, crispy tortillas and diced tomato. A wedge of fresh iceberg lettuce drizzled with bleu cheese dressing and topped with crispy bacon, tomato, red onion, hard boiled egg, bleu cheese crumbles and fresh croutons. Stick a fork into this hearty tossed salad. Enjoy mixed greens, tomato, hard boiled egg, cucumber, shredded cheddar cheese and house made croutons. Served with your choice of dressing. All Hail Caesar salad! 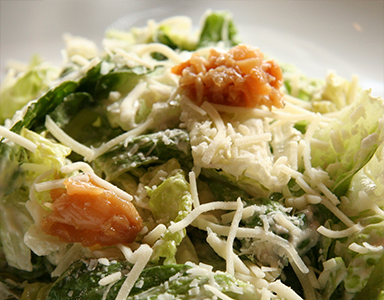 Try our creamy fresh house made Caesar dressing tossed with Romaine lettuce, grated Parmesan cheese and house made croutons. 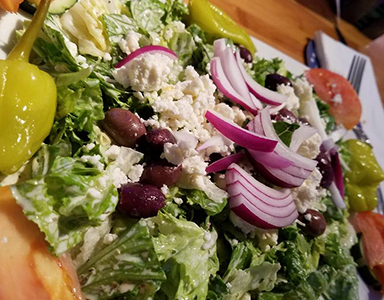 Mix it up with mixed greens tossed with Greek dressing, sliced red onion, cucumber, tomato, kalamata olives and pepperoncini. Topped with Feta cheese. Tossed in a Greek vinaigrette. House Greek, Blue Cheese, Ranch, Caesar and Balsamic Vinaigrette.